We’d love your help. Let us know what’s wrong with this preview of The Tao of Equus by Linda Kohanov. To ask other readers questions about The Tao of Equus, please sign up. Let me preface this review by saying I'm very sympathetic to the idea of it. I believe that animals have a soul, I believe in spiritual communication, I believe in animal rights, am a vegetarian, etc. I love horses, and find them one of the most beautiful, intelligent, spiritually attuned beings on earth. That said, this book is horrible. While the writing is not unreadable, the book ends up feeling more like the author's self-serving attempt to convince you how awesome she is for having these in Let me preface this review by saying I'm very sympathetic to the idea of it. I believe that animals have a soul, I believe in spiritual communication, I believe in animal rights, am a vegetarian, etc. I love horses, and find them one of the most beautiful, intelligent, spiritually attuned beings on earth. That said, this book is horrible. While the writing is not unreadable, the book ends up feeling more like the author's self-serving attempt to convince you how awesome she is for having these insights NO ONE HAS EVER HAD. It is poorly organized and confusing in content. Ultimately, I did not find anything insightful about the inner life of horses, or equine-human interaction. I just found a lot of drivel about how much the author loved her own epiphanies. This was one of the most horrible books it has been my displeasure to read. I am very open to the idea of the mystical and healing relationship with horses, and natural horsemanship. I have had horses my entire life and know first hand their ability to read emotional states. However, I am thoroughly sick and tired of natural horsemanship practitioners taking advantage of people new to the horse industry or people who have had bad experiences and are now timid or scared. Their marketing scemes ar This was one of the most horrible books it has been my displeasure to read. I am very open to the idea of the mystical and healing relationship with horses, and natural horsemanship. I have had horses my entire life and know first hand their ability to read emotional states. However, I am thoroughly sick and tired of natural horsemanship practitioners taking advantage of people new to the horse industry or people who have had bad experiences and are now timid or scared. Their marketing scemes are predatory and unhelpful. This lady is making a fortune by charging people to come spend time with her horses, hang out with them and is calling it psychotherapy?? I'm sorry but please stop. These people either need to work one on one with a trainer and their own horse, and/or an actual clinical psychotherapist. I had a huge problem with the dramatization of the twin foals saga. It's called responsible breeding of animals. Make the effort to make sure that you do a pregnancy check. Make sure that there are not twins, and continue to do vet checks throughout the pregnancy. The author's excuse of it was windy the day the vet was supposed to do the check or something to that effect was a thin excuse. You get the freakin horse to the vet to make sure you are protecting the health of the mother and the foal or you don't breed. PERIOD. Using the bad situation that she created as some sort of yin yang spiritual life and death struggle drama was unacceptable to me. Woman, you created the twin situation because you failed to do a basic ultrasound which is a standard requirement in horse breeding. One of the twin foals died as a result and the other was weak and almost died. Then you used that situation to your advantage for sympathy for yourself and "therapy" for your clients. You are an emotional predator, please go directly to a real psychotherapist and get your own issues handled. The Tao of Equus:, by Linda Kohanov, is one of my favorite books to describe the bond between horses and people. The extended title A Woman's Journey of Healing and Transformation Through the Way of the Horse is extraordinarily true to life. I have witnessed this many times with both gals and guys, but Linda’s leanings toward better results with gals is also a valid statement. Her telling of her story was great. Rural medical practice and natural horsemanship gave me unique tools to generate solu The Tao of Equus:, by Linda Kohanov, is one of my favorite books to describe the bond between horses and people. The extended title A Woman's Journey of Healing and Transformation Through the Way of the Horse is extraordinarily true to life. I have witnessed this many times with both gals and guys, but Linda’s leanings toward better results with gals is also a valid statement. Her telling of her story was great. Rural medical practice and natural horsemanship gave me unique tools to generate solutions for troubled youths and even adults to find true friends in developing rapport with a horse in the BFF style of thinking. Horses don’t judge, and treated like a BFF without any threats or abuse bilaterally begins the anthropomorphic partnership. This book exudes healing solutions for human and equine bonding. I truly enjoyed this book, and often can’t find my own since I lend it out a lot. Horse lovers and prospective horse lovers who haven’t read this book, SHOULD. I just re-read it after it was returned to me. Linda Kohanov has been through a healing journey personally and with horses and wants to tell everyone about the wonder of it. While I agree that there is a human animal bond that defies conventional explanations she tends to stretch logic a tad. Reads like a college thesis. THis book led me back to horses and gave me the courage I needed to begin riding again at 55. I struggled a little at first with this book. I loved the horse stories, but got mired in some of the science and history. Not that it was boring—far from it, but I am a speed reader. I can speed read a novel at a thousand words a minute. This book did not lend itself easily to that. I found myself wishing I had my own copy (which will be shortly remedied, as this is DEFINITELY a book I want to own) so I could highlight and take notes. Big sigh…..I do not know how to even come close writing a “r I struggled a little at first with this book. I loved the horse stories, but got mired in some of the science and history. Not that it was boring—far from it, but I am a speed reader. I can speed read a novel at a thousand words a minute. This book did not lend itself easily to that. I found myself wishing I had my own copy (which will be shortly remedied, as this is DEFINITELY a book I want to own) so I could highlight and take notes. Big sigh…..I do not know how to even come close writing a “review” . Questions were answered that I have had since childhood, such as why have I been entranced and drawn to horses since before I could even speak. There were also answers to Questions that I didn’t realize I even had. I cannot even begin to describe the impact and insights that reading this book opened up. What I can recommend is, that anyone who KEEPS horses, rides or trains them or who has ever desired to, should read this book. As well as anyone who is interested in any type of Energy healing, Life Coaching or helping those who have been traumatized in some way, whether they have any interest or experience with horses or not. I must admit that when I looked at this book when it first came out 8 years ago, I didn’t even bother checking it out, because it didn’t seem to address the kind of “horse” stories I was interested in. It looked like too much boring philosophy interwoven with New Age Woo Woo. It came into my life when I was finally ready for it. an amazing well written and extensive writing about horses and their universal energy and healing that Linda has learned to use in her clinics and her own equine centre. This is about equines and how they can teach people to rid of past baggage and current psychological issues through the assistance of psychologists and therapists and Linda's expertise and knowledge on connecting and learning from her own horses and others. I love horses and this book was a long extensive read but well worth it! Just our of this world. Linda knows her horses. When I read a blurb on the book, saying that the Author felt as though Horse were highly evolved spiritual beings, I knew right then that this was a book for me. I have always felt that why. This book explains why. Loved and looking very much to some of her other releases coming out by the same publisher. I believe one is a photography Coffee Table book. I'm sure it'll be spectacular. It's not just about the horses, but about the people around them, how they relate to each other and view themselves. I seem to read this series once a year, usually around the holidays, and see something new in it each time. I found the second book RIDING BETWEEN THE WORLDS more useful personally, but this is Kohanov's early journey before going between the worlds. So, read this one first, then serially. I loved this book and it was very timely for me to read. Her ability to describe/explain the spirituality, history and science behind our relationship with horses was exceptional. I believe she is daring in telling her stories because they are unconventional and not 'reasonable' but come from a deep spiritual/emotional side of her that I applaud her for. This book has helped further my search for the mystical, as well as shown a different perspective on our relationships with animals. Extraordinary, moving book, thanks to the writing skill, experiences and the research that went into it. An excellent book by an incredible woman. Heart, soul and spirit connections that heal and give light to darkness. One of the most beautiful gifts I have ever been given. I will never be without this book. Thank you deeply Michael. A very thought provoking read. It made interesting comparisons of keeping the yin and yang in life and horses and very Christ-like ways to gain peace and harmony with your self and horse. I enjoy the way the book was written it kept my mind thinking and me interested and engaged. I recommend this book to my dad and have purchased a hard copy for him. I choose the rating because I enjoyed the entire book and it was exceptionally well done. I’m finding her writing style to be somewhat unorganized and her sentences wordy and heavy with info. So far the story is laid out chronologically however another format may have been more effective. So far I’m finding the content interesting. Absolutely amazing. So soulful, spiritual and enlightening!!! Loved it! I did not learn as much as I was hoping I would, the author seems to think poorly of most humans, and this book could have been a lot shorter. Still, parts of it were inspirational and interesting. I don't have much experience with horses. But this was an interesting book to read as much of it connected with other books I have read about spirituality and the connectedness of life. This book brought up some huge questions for me. She talks about being able to commune with her ancestors, and in anything I've ever heard spirits are bad. But this book brought me to this question: is it possible that there are good spirits? And if there are: is it really possible to communicate with them? This is an open-minded view of this book. A skeptic would definitely put it down after the first two or three chapters saying, "this woman is out of her mind," or "this is bs," or something This book brought up some huge questions for me. She talks about being able to commune with her ancestors, and in anything I've ever heard spirits are bad. But this book brought me to this question: is it possible that there are good spirits? And if there are: is it really possible to communicate with them? This is an open-minded view of this book. A skeptic would definitely put it down after the first two or three chapters saying, "this woman is out of her mind," or "this is bs," or something along those lines. That's where I was, but I decided to keep reading and it definitely widened my view of horses and spirits and ways to communicate with horses. Linda is an author, speaker, riding instructor and horse trainer who has become an internationally recognized innovator in the field of Equine Experiential Learning and a respected writer on the subject of Equine Facilitated Psychotherapy. Her book "The Tao of Equus: A Woman’s Journey of Healing and Transformation through the Way of the Horse" was selected as one of the Top Ten Religion and Spiritu Linda is an author, speaker, riding instructor and horse trainer who has become an internationally recognized innovator in the field of Equine Experiential Learning and a respected writer on the subject of Equine Facilitated Psychotherapy. 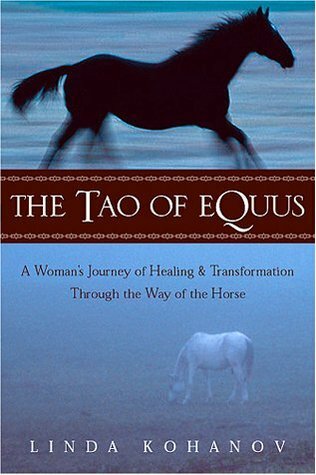 Her book "The Tao of Equus: A Woman’s Journey of Healing and Transformation through the Way of the Horse" was selected as one of the Top Ten Religion and Spirituality books of 2001 by Amazon.com. Her second book, "Riding Between the Worlds: Expanding Our Potential through the Way of the Horse", was published in 2003. Both books have been used as texts in university courses across the country and have received appreciative reviews in publications as diverse as Horse and Rider, Natural Horse, IONS Noetic Sciences Review, Shift, Spirituality and Health, Animal Wellness, The Equestrian News and Strides (the magazine published by the North American Riding for the Handicapped Association).